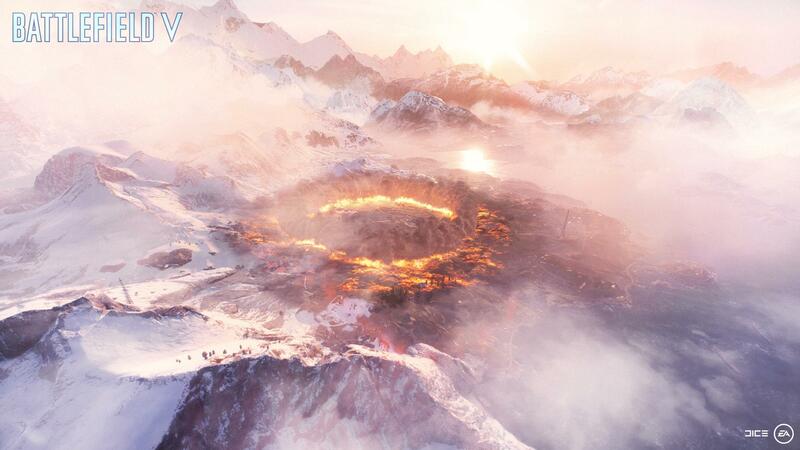 Battlefield 5 developer DICE has confirmed a few key details about Firestorm, the game’s battle royale mode. The Firestorm name itself was revealed in the recent This is Battlefield trailer, but those who have been following Battlefield 5 trailers will remember the teaser with the encroaching ring of fire at the very end of the the Company trailer. Firestorm is being developed by Criterion Games alongside DICE. Though it does retain some battle royale elements, some parts are more in common with traditional Battlefield than the last man standing mode. Players will airdrop onto the biggest map in Battlefield history with no fixed loadout, and they’ll have to scavenge for weapons and supplies. But that’s not the only way to get gear, Firestorm will also feature Conquest-style objectives, some random and others recurring at fixed locations. When claimed, you and your squad will be rewarded with rare and more powerful gear. The information doesn’t go into detail about how this particular aspect is going to work. Firestorm is only available to four-player squads, and it supports up to 64 players in total just like a regular Battlefield multiplayer match. Tanks do make a return, but it’s not clear how players will be able to acquire them. There are also other transport vehicles for all to use. Likewise, you can expect destruction to also make a difference in Firestorm compared to other battle royale modes. Firestorm progression is tied to the main game’s Company – a player collection of soldiers, weapons, and vehicles which levels up alongside the player. In today’s blog post, EA also revealed the Firestorm Ranger Set pre-order bonus. The set is inspired by Firestorm, but it can be used in any multiplayer mode. It comes with custom goggles, light battle fatigues, and the MKIII(S) Elite Combat Dagger.